My daughter's birthday cake! She's having a science party, but is really a very 'girly girl'. Not tomboy-ish or science-y at all. 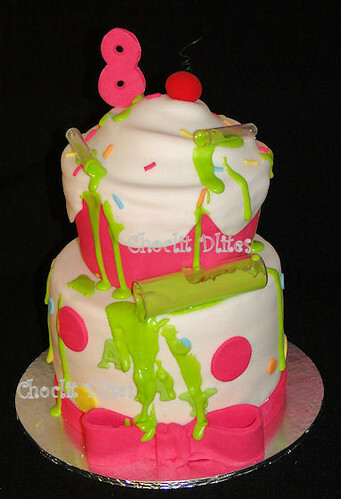 Her request was that I could do anything for her cake, as long as it had 'green goo'. So we end up with girly girl meets sci-fi!! The bottom tier is a 20cm vanilla sponge, which has 4 layers and coloured in varying shades of pink - will see how that looks when it's cut at the part tomorrow! The giant cupcake is a chocolate sponge and was based on all the awesome giant cupcakes I've seen on Flickr. Both the cupcake and bright colours were inspired by Andreas Sweetcakes.